Interest in 19th and early 20th century ceramics has declined. However there is a growing demand for individual pieces created by hand in small potteries. There is a wide range of Tremaen pottery that is available to the collector. The most expensive pieces are the lamp bases but small pebble vases can be purchased for just a few pounds. Pieces that were made for the tourist market have spread countrywide and they turn up in antique shops, antique fairs, flea markets or car boot sales. They are occasionally sold by auction houses and are listed regularly on internet auction sites. Production at Tremaen was not as prolific as at other Cornish potteries and the more desirable pieces are hard to find. 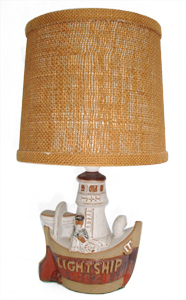 Few lamp bases have survived with their original lampshades. They were almost exclusively made of hessian, a natural product and an ideal choice to complement the bases. Most, however, have been discarded and new replacement hessian shades are difficult to find.